ThinkSTEAM: Can you tell us a little bit about yourself, your background, and where you grew up? Reshma Saujani: I grew up in Schaumburg, Illinois. My parents came to America as refugees to seek political asylum, so social justice was a huge part of my upbringing. My parents were both trained engineers but knew very little English. My mom worked as a cosmetics saleswoman and my dad was a machinist in a factory. From a very young age I knew I wanted to give back to my community. I studied Political Science at the University of Illinois, then went on to get my Master’s Degree in Public Policy from the John F. Kennedy School of Government at Harvard University, and got my law degree from Yale Law School. ThinkSTEAM: What was it like to be the first Indian – American to run for congress in 2010? Reshma Saujani: It’s very difficult to aspire to work in an industry where you look around and don’t see anyone that looks like you. One of our mantras at Girls Who Code is, ‘You cannot be what you cannot see’. It’s why we focus so much on introducing girls to role models and work to shift the cultural narrative around what a computer scientist actually does and looks like. I didn’t want to let being ‘the first’ or ‘the only’ get in the way of my dreams. It was a difficult journey getting to that point but also deeply rewarding experience for me. ThinkSTEAM: As a politician, what made you want to start Girls Who Code and raise STEM awareness? Reshma Saujani: On the campaign trail I would visit computer science classrooms in schools across the city, and I would look around and ask, ‘Where are the girls?’ This question became an obsession and after losing the race I started Girls Who Code. We started as one program in 2012 teaching 20 girls, to teaching over 40,000 girls across the US by the end of this year. ThinkSTEAM: What is your main focus with Girls Who Code? 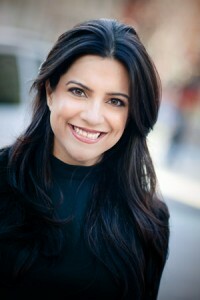 Reshma Saujani: To close the gender gap in technology. By 2020, there will be 1.4 million jobs open in computing and US graduates are on track to fill 28% of those jobs. Women are on track to fill only 3%. With more and more jobs being created in the computing fields, girls are being left behind from some of the fastest growing, highest paying jobs out there . Girls Who Code is building a movement to expose girls to computer science, equip them to pursue majors and careers in this field, and inspire them to use their knowledge to change the world. ThinkSTEAM: What qualities do you think girls will bring to computer science? Reshma Saujani: Women make the majority of consumer purchases. When you have women on your team you will build better, more innovative products that people actually want to buy. It’s a no-brainer for businesses. Girls Who Code is addressing a problem that a lot of people have an interest in solving. ThinkSTEAM: What are your future goals for Girls Who Code? Reshma Saujani: This year we’re focusing on building our community and extending our national footprint. By the end of 2016 we’ll have taught 40,000 girls computer science across all 50 states. To put that in perspective, only about 10,000 girls graduate each each year with a degree in computer science. We’re no longer just talking about closing the gender gap in tech, we’re actually doing it. Our goal is to make sure every girl in the nation has access to a computer science education, particularly girls from underserved communities. ThinkSTEAM: Your TED Talk on how we should teach girls bravery, not perfection was very inspiring. Do you think that girls, and parents of girls, are starting to embrace this? Reshma Saujani: Totally. I’ve had so many girls and women approach me with their own failure stories and I think the narrative around failure is slowly shifting. There’s a lot of research coming out on the subject lately. A new study recently that found that parents’ attitudes toward failure were linked with how their kids thought about intelligence. Parents who tended to view failure as negative had children who were more likely to believe that intelligence is fixed. The study found that the more negative parents’ attitudes were, the more likely their children were to see them as being concerned with performance as opposed to learning. It’s the “I’d rather show nothing than show my mistakes” mentality we see in our programs. We talk about this in the context of computer science, but I think it’s a universal feeling a lot of girls and women struggle with. ThinkSTEAM: What is your advice for young girls who want to change the world with computer science? Reshma Saujani: Go for it. Whatever you want to do – whether you want to be the next Hillary Clinton or Beyonce – you need to learn to code!